Around 7:30 pm on May 27, the intruders arrived. Westcott followed the officers’ advice, grabbed his gun to defend his home, and died pointing it at the intruders. They used a semiautomatic shotgun and handgun to shoot down the 29-year-old motorcycle mechanic. He was hit three times, once in the arm and twice in his side, and pronounced dead upon arrival at the hospital. The intruders, however, weren’t small-time crooks looking to make a small score. Rather, they were members of the Tampa Bay Police Department’s SWAT team, which was executing a search warrant on suspicion that Westcott and his partner were marijuana dealers. They had been tipped off by a confidential informant, whom they drove to Westcott’s home four times between February and May to purchase small amounts of marijuana, at $20–$60 a pop. The informer notified police that he saw two handguns in the home, which was why the Tampa Bay police deployed a SWAT team to execute the search warrant. In the end, the same police department that told Westcott to protect his home with defensive force killed him when he did. After searching his small rental, the cops indeed found weed, two dollars’ worth, and one legal handgun—the one he was clutching when the bullets ripped into him. 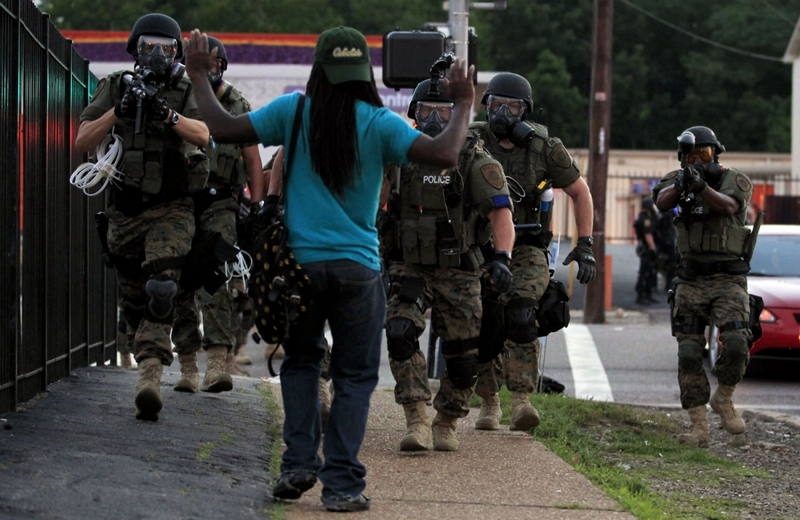 The cancer of militarized policing has long been metastasizing in the body politic. It has been growing ever stronger since the first Special Weapons and Tactics (SWAT) teams were born in the 1960s in response to that decade’s turbulent mix of riots, disturbances and senseless violence like Charles Whitman’s infamous clocktower rampage in Austin, Texas. While SWAT isn’t the only indicator that the militarization of American policing is increasing, it is the most recognizable. The proliferation of SWAT teams across the country and their paramilitary tactics have spread a violent form of policing designed for the extraordinary but in these years made ordinary. When the concept of SWAT arose out of the Philadelphia and Los Angeles Police Departments, it was quickly picked up by big-city police officials nationwide. Initially, however, it was an elite force reserved for uniquely dangerous incidents, such as active shooters, hostage situations or large-scale disturbances. In 1984, according to Radley Balko’s Rise of the Warrior Cop, about 26 percent percent of towns with populations between 25,000 and 50,000 had SWAT teams. By 2005, that number had soared to 80 percent and it’s still rising, though SWAT statistics are notoriously hard to come by. In a recently released report, “War Comes Home,” the American Civil Liberties Union (my employer) discovered that nearly 80 percent of all SWAT raids it reviewed between 2011 and 2012 were deployed to execute a search warrant. Pause here a moment and consider that these violent home invasions are routinely used against people who are only suspected of a crime. Up-armored paramilitary teams now regularly bash down doors in search of evidence of a possible crime. In other words, police departments increasingly choose a tactic that often results in injury and property damage as its first option, not the one of last resort. In more than 60 percent of the raids the ACLU investigated, SWAT members rammed down doors in search of possible drugs, not to save a hostage, respond to a barricade situation, or neutralize an active shooter. On the other side of that broken-down door, more often than not, are blacks and Latinos. When the ACLU could identify the race of the person or people whose home was being broken into, 68 percent of the SWAT raids against minorities were for the purpose of executing a warrant in search of drugs. When it came to whites, that figure dropped to 38 percent, despite the well-known fact that blacks, whites and Latinos all use drugs at roughly the same rates. SWAT teams, it seems, have a disturbing record of disproportionately applying their specialized skill set within communities of color. This authoritarian streak runs counter to the core philosophy that supposedly dominates twenty-first-century American thinking: community policing. Its emphasis is on a mission of “keeping the peace” by creating and maintaining partnerships of trust with and in the communities served. Under the community model, which happens to be the official policing philosophy of the US government, officers are protectors but also problem solvers who are supposed to care, first and foremost, about how their communities see them. They don’t command respect, the theory goes: they earn it. Fear isn’t supposed to be their currency. Trust is. Lucky for Federspiel, his exercise in paranoid disaster preparedness didn’t cost his office a penny. That $425,000 MRAP came as a gift, courtesy of Uncle Sam, from one of our far-flung counterinsurgency wars. The nasty little secret of policing’s militarization is that taxpayers are subsidizing it through programs overseen by the Pentagon, the Department of Homeland Security and the Justice Department. Take the 1033 program. The Defense Logistics Agency (DLA) may be an obscure agency within the Department of Defense, but through the 1033 program, which it oversees, it’s one of the core enablers of American policing’s excessive militarization. Beginning in 1990, Congress authorized the Pentagon to transfer its surplus property free of charge to federal, state and local police departments to wage the war on drugs. In 1997, Congress expanded the purpose of the program to include counterterrorism in section 1033 of the defense authorization bill. In one single page of a 450-page law, Congress helped sow the seeds of today’s warrior cops. The amount of military hardware transferred through the program has grown astronomically over the years. In 1990, the Pentagon gave $1 million worth of equipment to US law enforcement. That number had jumped to nearly $450 million in 2013. Overall, the program has shipped off more than $4.3 billion worth of materiel to state and local cops, according to the DLA. 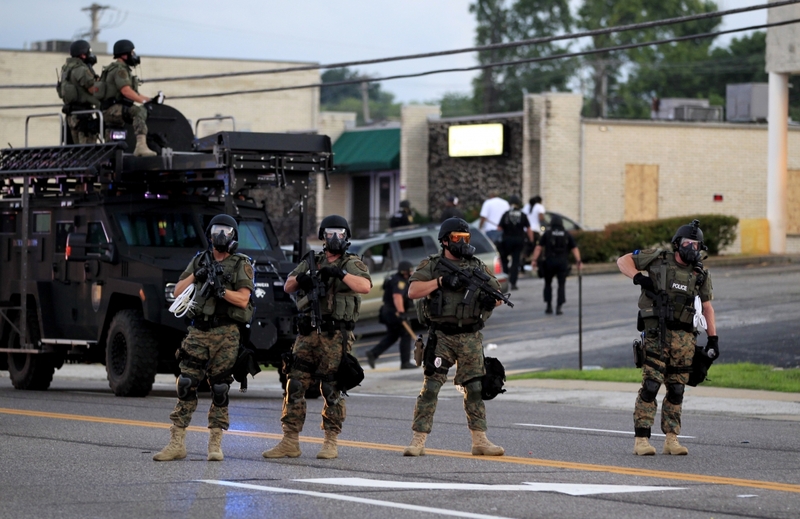 In its recent report, the ACLU found a disturbing range of military gear being transferred to civilian police departments nationwide. Police in North Little Rock, Arkansas, for instance, received 34 automatic and semi-automatic rifles, two robots that can be armed, military helmets, and a Mamba tactical vehicle. Police in Gwinnet County, Georgia, received fifty-seven semi-automatic rifles, mostly M-16s and M-14s. The Utah Highway Patrol, according to a Salt Lake City Tribune investigation, got an MRAP from the 1033 program, and Utah police received 1,230 rifles and four grenade launchers. After South Carolina’s Columbia Police Department received its very own MRAP worth $658,000, its SWAT Commander Captain E.M. Marsh noted that 500 similar vehicles had been distributed to law enforcement organizations across the country. Astoundingly, one-third of all war materiel parceled out to state, local and tribal police agencies is brand new. This raises further disconcerting questions: Is the Pentagon simply wasteful when it purchases military weapons and equipment with taxpayer dollars? Or could this be another downstream, subsidized market for defense contractors? Whatever the answer, the Pentagon is actively distributing weaponry and equipment made for US counterinsurgency campaigns abroad to police who patrol American streets and this is considered sound policy in Washington. The message seems striking enough: what might be necessary for Kabul might also be necessary for DeKalb County. As with the 1033 program, neither DHS nor state and local governments account for how the equipment, including body armor and drones, is used. While the rationale behind stocking up on these military-grade supplies is invariably the possibility of a terrorist attack, school shooting or some other horrific event, the gear is normally used to conduct paramilitary drug raids, as Balko notes. In 1988, Congress authorized the Byrne grant programs in the Anti–Drug Abuse Act, which gave state and local police federal funds to enlist in the government’s drug war. That grant program, according to Balko, led to the creation of regional and multijurisdictional narcotics task forces, which gorged themselves on federal money and, with little federal, state or local oversight, spent it beefing up their weapons and tactics. In 2011, 585 of these task forces operated off of Byrne grant funding. Just ask the parents of Bou Bou Phonesavanh. Around 3 am on May 28, the Habersham County Special Response Team conducted a no-knock raid at a relative’s home near Cornelia, Georgia, where the family was staying. The officers were looking for the homeowner’s son, whom they suspected of selling $50 worth of drugs to a confidential informant. As it happened, he no longer lived there. Despite evidence that children were present—a minivan in the driveway, children’s toys littering the yard, and a Pack ’n Play next to the door—a SWAT officer tossed a “flashbang” grenade into the home. It landed in 19-month-old Bou Bou’s crib and exploded, critically wounding the toddler. When his distraught mother tried to reach him, officers screamed at her to sit down and shut up, telling her that her child was fine and had just lost a tooth. In fact, his nose was hanging off his face, his body had been severely burned, and he had a hole in his chest. Rushed to the hospital, Bou Bou had to be put into a medically induced coma. In her defense of the SWAT raid, Castor simply dismissed any responsibility for Westcott’s death. “They did everything they could to serve this warrant in a safe manner,” she wrote the Tampa Bay Times— “everything,” that is, but find an alternative to storming the home of a man they knew feared for his life. 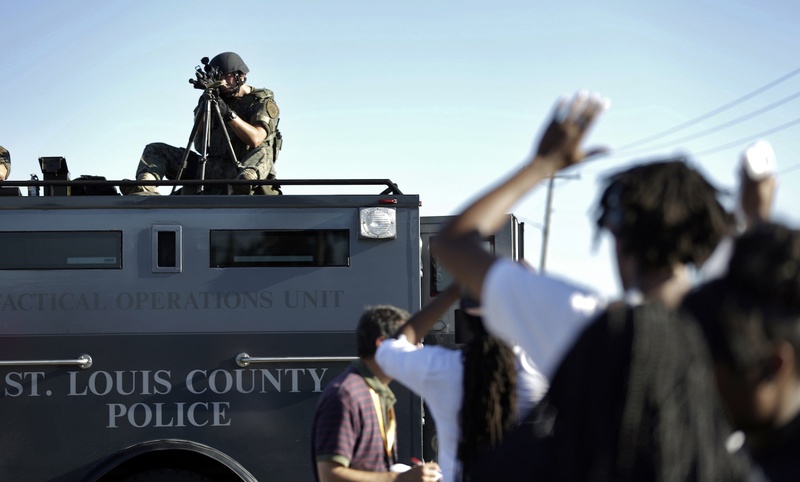 The militarization of the police shouldn’t be surprising. As Hubert Williams, a former police director of Newark, New Jersey, and Patrick V. Murphy, former commissioner of the New York City Police Department, put it nearly twenty-five years ago, police are “barometers of the society in which they operate.” In post-9/11 America, that means police forces imbued with the “hooah” mentality of soldiers and acting as if they are fighting an insurgency in their own backyard. These former policemen and law enforcement officials understand that police officers shouldn’t be breaking down any citizen’s door at 3 am armed with AR-15s and flashbang grenades in search of a small amount of drugs, while an MRAP idles in the driveway. The anti-militarists, however, are in the minority right now. And until that changes, violent paramilitary police raids will continue to break down the doors of nearly 1,000 American households a week. Matthew HarwoodTwitterMatthew Harwood is senior writer/editor with the ACLU.